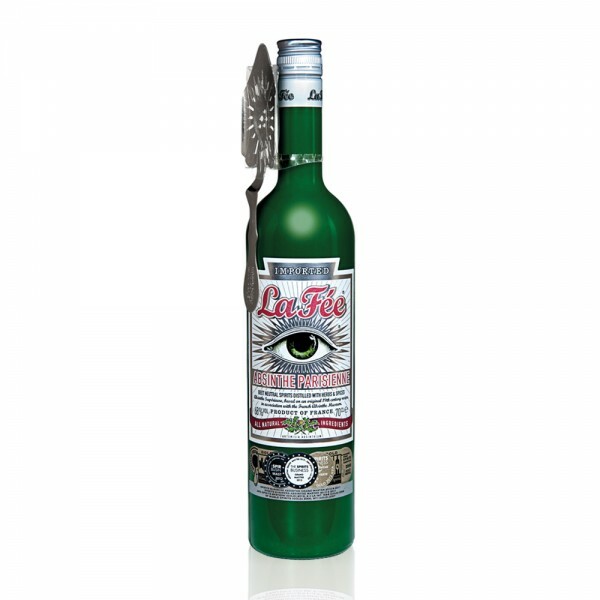 La Fée Absinthe Parisienne is an iconic absinthe brand, which returned traditional absinthe distillation to France in 2000, successfully lifting the 1915 ban on the spirit. Popular in the late 19th and early 20th century, especially in France among impressionist artists and writers such as Van Gogh, Lautrec and Baudelaire, absinthe is a distilled 68% ABV spirit derived from herbs and the fundamental ingredient of grand wormwood (Artemisia absinthium). Blamed for madness and supposed hallucinations, La Fée Absinthe Parisienne has revived the classic spirit for a modern audience. Distilled in the Rhone-Alps and bottled in Paris, La Fée uses an authentic 19th century Verte recipe, using nine herbs and spices including Wormwood, Anise and Fennel. This is a clean, dry and herbaceous Absinthe ideal for cocktails and the traditional serve. Pour one measure of La Fée Absinthe Parisienne into a glass. Place one or two sugar cubes on a La Fée absinthe spoon, over the glass. The milky green clouding effect is known as the famous absinthe 'louche'.